Today's Free GM Resource is a "side quest" for a game I don't own....yet. Drinking Quest has been on my radar as part of my "wish list" for couple of years now. Saloon of Horrors is a "parody dungeon" for Drinking Quest that actually has the blessing of DQ's creator, at least according to the Side Quest's creator. 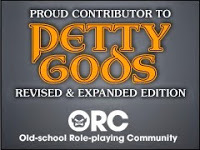 One aspect I just love about our hobby is that a lot of folks, especially in the OSR movement (yes, I get that DQ isn't an OSR game), is that we take our love of a cherished game and channel it into creating stuff not only for that cherished game, but for other's to enjoy as well.